Before the lesson, students tackle the problem individually. You assess their responses and formulate questions that will prompt them to review their work. At the start of the lesson, students respond individually to the questions set, and then work in groups to combine their thinking and produce a collaborative solution in the form of a poster. 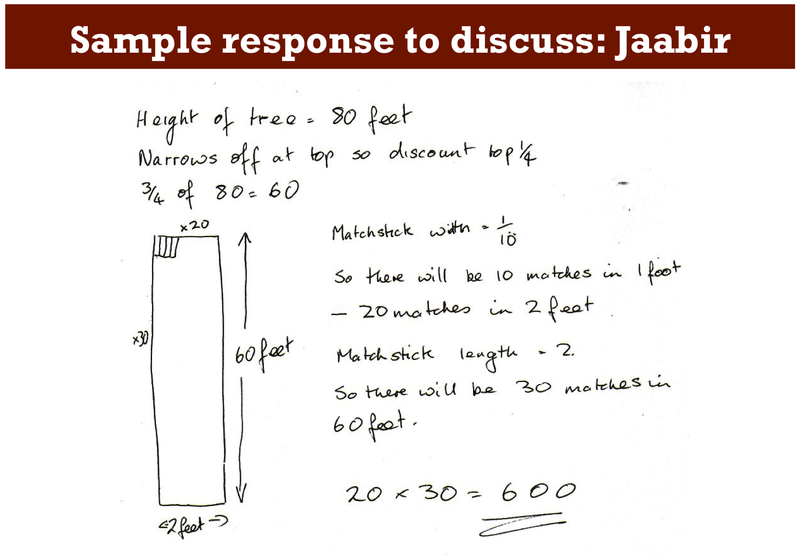 In the same small groups, students evaluate and comment on some sample responses. They identify the strengths and mistakes in these responses and compare them with their own work. In a whole-class discussion, students explain and compare the solution strategies they have seen and used. Each student will need a calculator, a copy of Making Matchsticks, a copy of the Formula Sheet, a blank sheet of paper, and a copy of the How Did You Work? questionnaire. Each small group of students will need a large sheet of paper for making a poster, felt-tipped pens, and copies of Sample Responses to Discuss. There is a projector resource to help you with whole-class discussions. 15 minutes before the lesson, a 90-minute lesson (or split into two shorter lessons), and 15 minutes in a follow-up lesson. Timings given are only approximate. Exact timings will depend on the needs of the class.